In this tutorial we will learn how to create a custom pipeline for Online Data Analysis (ODA) on a concrete & useful example, even if it is not directly related to synchrotron radiation. This proves EDNA is a generic purpose framework. Run them all on a set of raw-images. The suggested pipeline is for developing raw images. As the developments operation (conversion raw -> JPEG) can be CPU-consuming (between 1 and 10 seconds per image), using the multi-threading capabilities of EDNA is very interesting. In this pipeline, we will also take care of the metadata associated to the raw-image and transfer them from the raw to the developed image (as Exif tags) and prepare the archiving of the raw file using a compressor like zip or bzip2 (you can win a factor 2 to 3 in the size for archiving). Dcraw provides a multi-plateform solution for extracting images from Raw files. It is compatible with most of the models of digital cameras and it is a command line tool, well suited for creating an execution plugin derived from EDPluginExecProcessScript. As DCraw does only the raw development, we will have to re-compress the extracted image in a format suited for web-publication like JPEG. This can be done with a tool like convert from ImageMagick or with the Python Imaging Library. Fortunately, conversion to JPEG are pretty common an such a plugin already exists in the EDNA-toolbox (EDPluginExecThumbnailv10). The transfer of metadata will be made using pyexiv2, a python binding for the C++ library exiv2. Finally we will have to remove some temporary files (directly coded in python) and compress the raw-file, again using an existing plugin called EDPluginExecCommandLinev10. This pipeline is (more or less) available in the SVN of EDNA, this can help you if feel lost in doing this tutorial, but as each plugin is supposed to be unique, we have to start from a snapshot of the repository without the project photov1. For this download the latest nightly build from ExecPlugins, uncompress it, setup environment variables and run the tests for the kernel and the test for the two plugins from the toolbox we intent to use. The name of EDNA_SITE is for the moment not important, it is just a way to tell EDNA what configuration to use. For running EDNA, you will need a python interpreter, between version 2.5 and <3.0. Compatibility with python3 is not yet checked. If the tests are crashing, please contact the team of EDNA-developers for support !!! You can look at the log files created and the libraries with all input and output of all plugins. Post-mortem analysis is always possible with EDNA using those logs. This is your first EDNA ExecPlugin, in a sense it is only a wrapper for the dcraw program. At this point you will need to install the program DCRaw. All input and output of an EDNA plugin is managed by data models which are first represented as UML diagram the exported to XSD and finally converted to python code using meta-programming. In EDNA we have two kind of class described in this way XSDataInput and XSDataResult, they represent container for data input and data output of any EDNA plugin. XSDataInputExecDcrawv1 is the name of the input class, it inherits from XSDataInput (or extends it). Among the attributes of XSDataInputExecDcrawv1, we have the filename of Raw image (rawImagePath) which is the only mandatory attribute. All other attributes (outputPath, extractThumbnail, ...) are optional, identified by their cardinality [0..1] (either 0 or 1 attribute). Documentation can also be added in the datamodel, here we re-use the man-page of dcraw. The transcription in XSD is a direct conversion (done inside Enterprise Architect) in XML of the data structure. Each class (XSDataInputExecDcrawv1 & XSDataResultExecDcrawv1) inherits from a class defined in the datamodel of the kernel (XSDataInput, XSDataResult). You can see that variable have their type defines, like XSDataBoolean, which is also defined the EDNA kernel datamodel (XSDataCommon). enforce python to define the type of structure exchanged: in python typing is strong but dynamic. Here we manage to have static, strongly typed and expandable types. serialize in XML all input and output of any plugin. This is extremly useful for post-mortem analysis and debugging. This program is designed to allow the auto generation of an EDNA plugin. kernel, it must also contain the base directory structure of the project you want to use. is not specified (using the local xsd). Specifies the input XSData class, e.g. Specifies the result XSData class, e.g. plugin is populated with a directory called EDPluginDcrawv1_0, containing you plugin and it's tests. Those tests have just been executed and they should be successful. It's hard to believe but without having coded anything, half of the work is already done, so it's probably time for a coffee-break ! modify slightly this script, especially those 3 lines, defining the various path. This is the point where it starts to be interesting, because we will test that it running ... For running tests we need to prepare data: take a "raw image" and run dcraw on it to develop it. Of course now the tests fail ... because the output is not correct. Indeed nothing runs. Start by adding all mandatory parameters in the checkParameters method, here only the raw file name. Replace everywhere EDPluginExec by EDPluginExecProcessScript because we will call an external program via a script. self.__strOutputType = None #we cannot know what find of thumbnail is saved, can be jpeg, tiff or nothing ! Write from scratch the generateCommandLineDcraw method with all options. Now the test are running. if you use the --debug switch in the test command line you get additional information, including profiling info. In the execution test we wrote, we compare the output file to a reference file, character by character. A slight difference in those will break the test and this happens all the time when changing CPU architecture, compiler optimization options, ... One solution to go around this is to read the output images as images and then compare images. print "Wrong PIL: Remove old PIL from imported modules"
We accept that the image made by difference between reference and obtained are limited to 12 unit of color (out of 255) on every channel. This variation is pretty large, largest differences having been observed between computer in 32 and 64 bits. You noticed we did not test all options in dcraw. For this we will create many EDTestCaseExecute with (ideally) all options tested. Then create an EDTestSuiteExecute, chaining all EDTestCaseExecute. 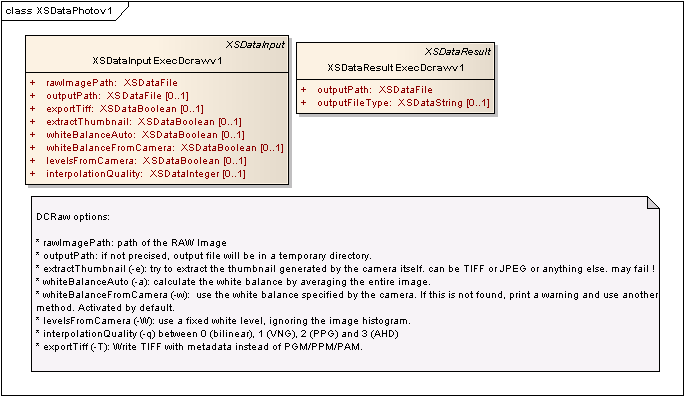 Very simple datamodel: in input two files: the Raw and the Jpeg file, in output only one. Remove the $EDNA_HOME/.XSDataDictionaryModule.xml that keeps track of all plugins. In the process method, open both exifs structures, copy the one from input to output. Save output. In the postProcess, just report the name if the output file. As for execution plugins, control plugins (pipelines) have datamodels, both for input and for outputs. In this datamodel, the only mandatory part is the input Raw file. There are a few optional parameters to specify the ouput filename or if you want to modify slightly the behaviour of the plugin. An automatic launcher can be built in inheriting from EDParallelExecute. The only thing to do is provide a function, that converts an input filename into an acceptable XML string for the plugin. This page was last modified on 25 September 2010, at 22:07.